Great Britain 1689 William & Mary gold Coronation Medal NGC AU Details RARE!! 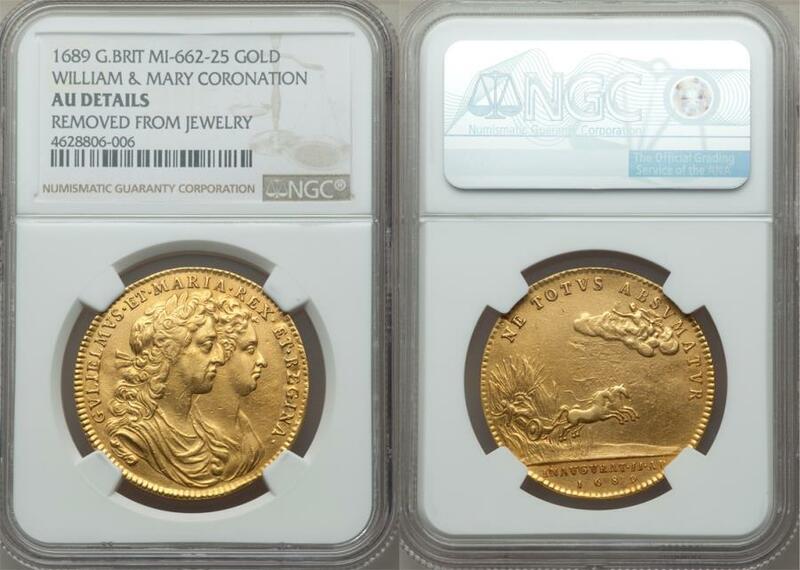 Great Britain 1689 William & Mary gold Coronation Medal NGC AU Details 35mm. By J. Roettier. Rare gold medal is one of only 715 produced to celebrate the coronation of William and Mary, distributed by the king amongst the Commons and his courtiers. The present offering has likely received its details designation as a result of its exhibiting evidence of past cleaning, as it shows little in the way of mount marks commensurate with its being removed from jewelery. One of the most popular of the British coronation medal series and in a highly collectable level of preservation! Australia 1887-S Young Victoria Gold Half Sovereign NGC XF-45 RARE!! 2011 Elizabeth II 1 oz Gold Proof 100 Dollars PCGS PR-70 Deep Cameo, Mintage:1500 ! !